No matter where you work if you want to look stylish you’ll need a pair of high-quality dress shoes in your wardrobe. From wearing them at work, you can also use them for a friend’s wedding or any other special occasion. So if you’re looking for a pair of quality dress shoes, one which bodes well for your personality, have a look at the Nunn Bush Men’s Bourbon St Lace-Up shoes. Available in three different designs, including a stylish black as well as an elegant brown color scheme, the Nunn Bush Men's Bourbon St Lace-Up shoes have been carefully crafted for all those men who want to look good, regardless of the occasion. Featuring a durable construction, this shoe is made of genuine leather so you should be able to wear this product for a considerable length of time. Nunn Bush has been making high-quality footwear since 1912. Having an unparalleled experience of more than 10 decades, this brand comes with a massive fan following. The Nunn Bush Men’s Bourbon St Lace-Up is the latest product from this manufacturer which is designed to appeal to those looking to impress. The upper of the Nunn Bush Men’s Bourbon St Lace-Up is made of smooth leather which is carefully selected for this particular purpose. The leather upper is quite easy to clean as you can easily do it with a soft cloth. The upper is further complemented by a snug lace-up closure mechanism which, as compared to the slip-on design, looks good with a wide range of suit types. Thanks to such a construction, you can wear this shoe at your office, at a birthday party or any other social gathering as this product won’t feel out of place in any environment. Inside the Nunn Bush Men’s Bourbon St Lace-Up is a comfortable KORE midsole imparts comfortability to your feet. This midsole is basically made from EVA foam which is a popular choice amongst a wide range of shoe manufacturers. Extremely lightweight, this foam absorbs much of the shock – at the moment of impact – which results in a comfortable experience inside this shoe. 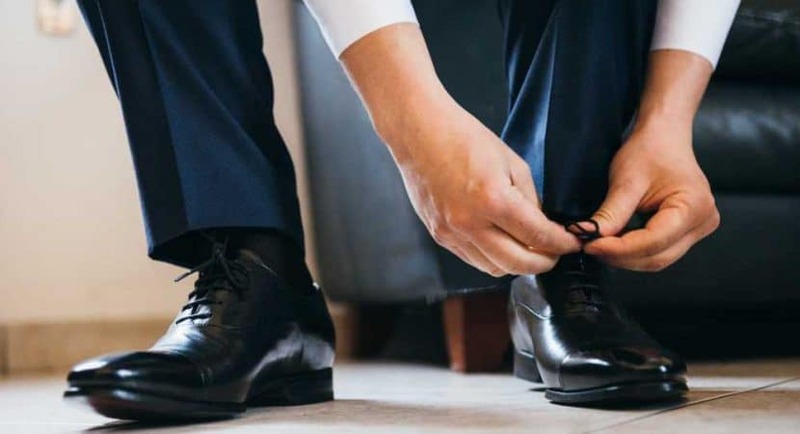 For making sure that the owner of this shoe can walk on all kinds of terrains without worrying about unintended slippage, the manufacturer has employed a slip-resistant rubber outsole in these men’s lace up dress shoes. Furthermore, this is a non-marking dual density outsole which is biomechanically designed for the ease of walking. So apart from protecting your feet, it will also protect the underneath terrain from any kind of damage. When some people believe that a stylish pair of dress shoes just cannot be comfortable, they should have a look at the Nunn Bush Men’s Bourbon St Lace-Up. Extremely elegant, the manufacturer has designed it with just 1’’ heel height. Even after spending a full day at work inside this model, or wearing this shoe on the dance floor, such an optimal heel height makes sure that the wearer of this shoe doesn’t have to suffer from any kind of blisters. While making this purchase, customers should keep this thing in mind that as compared to other dress shoes, the Nunn Bush Men’s Bourbon St Lace-Up tends to run a bit big in size. In fact, as compared to your actual feet size, it might be better to order half a size less in this model. Otherwise, you might have to be content with a pair of shoes which may be too big as per your liking. These Nunn Bush men’s shoes come with an upper made of specially selected leather. The lightweight KORE midsole allows under the foot cushioning while the structurally crafted gel pad absorbs impact as you take one step after the other. Lastly, the slip-resistant outsole ensures that the wearer stays sure-footed in front of his colleagues. These popular shoes made by a well-known manufacturer, the Nunn Bush Men's Bourbon St Lace-Up are a versatile pair of shoes which can accommodate a wide range of customers. When you can wear it for every day at the office, its elegant look makes it a perfect match for many different kinds of social gatherings. Especially when it comes with a non-marking outsole, you can easily wear it on the dance floor as this model won’t leave any damaging marks. 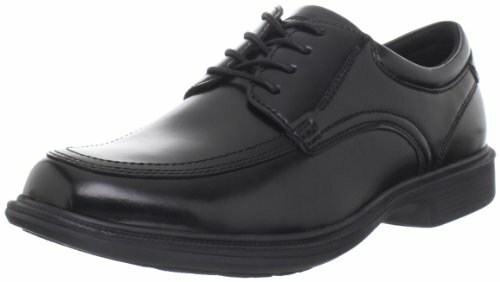 In addition, these shoes can be purchased for a reasonable price making the Nunn Bush Men’s Bourbon St lace up dress shoes a worthwhile investment.